March 19, 2015: When you attach the prefix "nano" to something, it usually means "very small." Solar flares appear to be the exception. 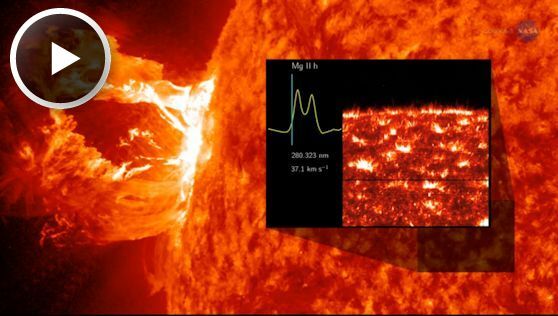 Researchers are studying a type of explosion on the sun called a 'nanoflare.' A billion times less energetic than ordinary flares, nanoflares have a power that belies their name. "A typical 'nanoflare' has the same energy as 240 megatons of TNT," says physicist David Smith of UC Santa Cruz. "That would be something like 10,000 atomic fission bombs." The sun can go days, weeks or even months without producing an ordinary solar flare. Nanoflares, on the other hand, are crackling on the sun almost non-stop. "They appear as little brightenings of the solar surface at extreme ultraviolet and X-ray wavelengths," continues Smith. "The first sightings go back to Skylab in the 1970s." The relentless crackle of nanoflares might solve a long-standing mystery in solar physics: What causes the sun's corona to be so hot? Imagine standing in front of a roaring fire. You feel the warmth of the flames. Now back away. You get cooler, right? That's not how it works on the sun. The visible surface of the sun has a temperature of 5500 C. Moving away from the surface should provide some relief. Instead, the sun's upper atmosphere, known as the "solar corona," sizzles at a million degrees--a temperature almost 200 times higher than that of the roaring furnace below. Smith thinks nanoflares might be involved. For one thing, they appear to be active throughout the solar cycle, which would explain why the corona remains hot during Solar Minimum. And while each individual nanoflare falls short of the energy required to heat the sun's atmosphere, collectively they might have no trouble doing to job. Launched in 2012, NASA's NuSTAR X-ray telescope is on a mission to study black holes and other extreme objects in the distant cosmos. Solar scientists first thought of using NuSTAR to study the sun about seven years ago, after the space telescope's design and construction was underway. Smith contacted the principal investigator, Fiona Harrison of the California Institute of Technology in Pasadena, to see what she thought. "At first I thought the whole idea was crazy," says Harrison. "Why would we have the most sensitive high energy X-ray telescope ever built, designed to peer deep into the universe, look at something in our own back yard?" Eventually, she was convinced. As Smith explained, NuSTAR has just the right combination of sensitivity and resolution to study the telltale X-ray flickers of nanoflares. A test image they took in late 2014 removed any doubt. 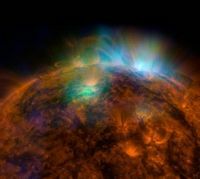 NuSTAR turned toward the sun and, working together with NASA's Solar Dynamics Observatory, captured one of the most beautiful images in the history of solar astronomy. Will it solve the mystery of nanoflares and the solar corona? "I don't know," says Smith, "but I cannot wait to try."